What exactly goes into callsheet? Which producer’s names go on the top? Where do you put the parking details? Is the lunch menu listed? We had a chance to interview 1st AD Alex Stein to discuss the anatomy of a call sheet. 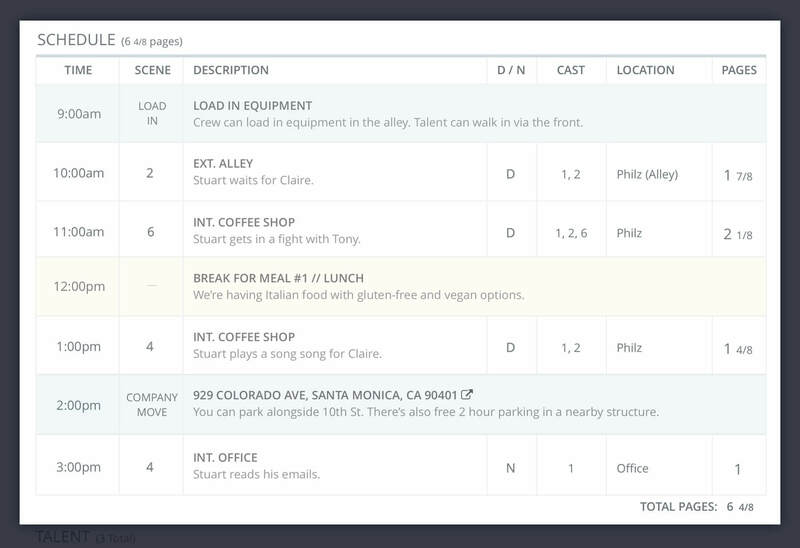 In this article (and video), Alex Stein breaks down all the components that should be included in a standard call sheet for film and television. The daily call sheet is a filmmaking term for the schedule implemented by the assistant director (AD), using details from the shooting schedule and shot list associated with each scene that will be filmed that day. The callsheet is send to the cast and crew of the film production to let them know about where and when the filming is going to take place. Right-click and save high-res image here. At the top-left corner of a call sheet, you can usually find the production company logo, production office details, and VIP contacts (i.e. director, producer, 1st assistant director, etc.). If a talent or crew member needs to get in touch with someone ASAP, this is where they’d look first. Every callsheet needs to have the title of the production and general crew call time prominently placed near the top. If you have a special announcement to highlight, this is a great place for it. Usually near the top, you’ll find the date and what day of the shoot you’re on, known as the Day Out of Days report. Weather is also placed in this vicinity, and indicates high/low temperatures, sunrise / sunset times, and other details. 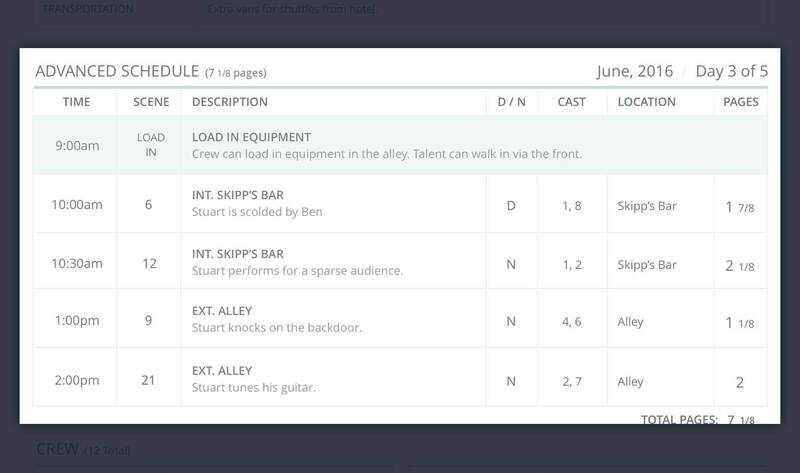 Some call sheets, particularly more robust, feature film call sheets (like the template we developed for StudioBinder) may summarize the day’s schedule up top and call out key times like Shooting call, Meal Breaks, and Estimated Wrap. Locations are often stated near the top half of a call sheet. If there’s more than one location, label each with a number (i.e. “Location 1,” “Location 2,” “Location 3” etc.). Also include the address for parking since it is usually different than where you’ll be shooting. If there are any notes about parking, driving directions, or shuttles, this is where you would include it. Regardless of production scale, always include the location of the nearest hospital to each location. The only time you’ll need be looking this up on the callsheet is when you have a serious emergency on set, so it’s important. Double check to make sure your call sheet lists a full hospital with an 24 hour emergency center (not just a local clinic). The next major chunk of a callsheet is dedicated to what you’re actually shooting for that day. At the bottom, sum up all the pages to get a total page count for the day. A typical, dialogue-driven indie film shoots about 5 pages per day. Don’t forget to include what time lunch will be served! According to union rules, a full meal must be served no more than six hours from the general crew call. If you have any company moves, add them as well (include time, address, and parking notes). StudioBinder colors schedule notes and company moves yellow and blue respectively. Below the schedule for the day, you can find there will be a section that indicates talent call times for the day. This area typically has the talent’s name, character ID number (i.e. 1, 2, 3, etc. ), character name, status, and call times. WHAT DOES STATUS MEAN ON A CALL SHEET? 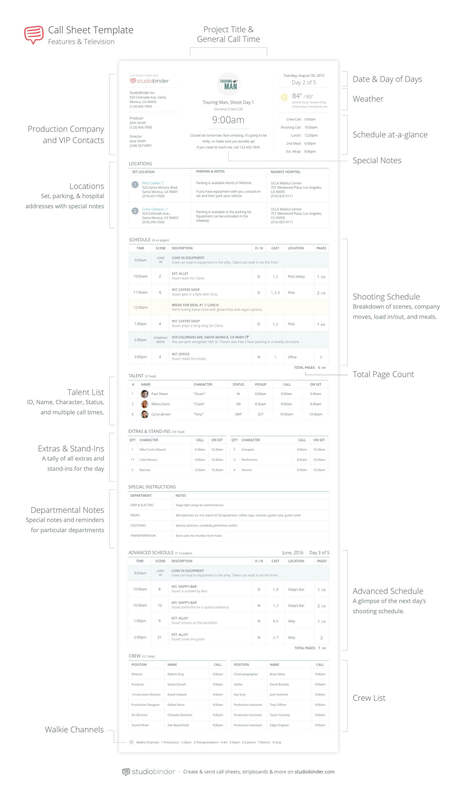 The status column indicates the length of the talent’s job on a multi-day project. The column is populated with a combination of the letters S, W, H, F, which stands for Start, Work, Hold, Finish. “SW” stands for “Starts Work,” and means it is the talent’s first day on the job. “W” stands for “Works,” and it means your talent is in the midst of their job. “WF” stands for “Work Finish,” and it means it is your talent’s last day on the job. “SWF” stands for “Start-Work-Finish,” and it means your talent will work for just that one day. “H” stands for “Hold,” and it means that your talent is not being used that day. WHAT DOES PICKUP AND ON SET MEAN ON A CALL SHEET? Pickup indicates what time talent will be picked up for transport to set. This is most often used when talent is shooting away from home, and will be shuttled from their hotel lodging. The “On Set” call time column indicates what time the talent must be finished with makeup / wardrobe, and report to set for performance. The extras list features a headcount of all the extra ‘types’ that will be coming in that day along with their call times. So for example, if you’re shooting a scene that takes place in a Cafe, you could have 17 extras playing cafe patrons, 3 baristas, 4 servers, etc. You then add up all of the extras to get a total head count. This informs the production unit, make-up, wardrobe, catering, assistant director (etc) of the number of extras that will need to be maintained that day. A stand-in or stunt person, is someone that that stands in for major talent when their face is not featured on-camera, or when they’re not performing their own stunts. Similar to extras, they usually have one or two call times. However, a stand-in or stunt person’s name should be stated along with the name of the talent or character they are standing in for. In most callsheets, you’ll need an area to highlight specific notes for departments. These notes can be anything; key props in the scene, wardrobe, a note regarding a complicated lighting setup, or a reminder to bring something to set (i.e. paperwork). You get the idea. After talent, you can add a list of all the crew members in attendance that day. Usually all you need is their position, name and call time. Some productions like to include contact details as well. An advanced schedule is essentially a preliminary shooting schedule for the next day. This is not always necessary (as changes are made daily to the shooting schedule), but it’s helpful in many cases to provide the talent and crew an idea of what’s coming up on the next day of the shoot so they can prep. The advanced schedule looks exactly like the schedule featured above (see point #5), but to avoid confusion, it is labeled “Advanced Schedule” with the corresponding date and appropriate day-of-days. You can add walkie channels in the footer or general notes of a call sheet. Although there are industry standards for which channels to use for certain departments, sometimes channels may vary by production so it’s best practice to have them listed out on the callsheet. If you’re looking to create a call sheet, you can create it either do it in Excel or use free production management software like StudioBinder. Call sheets can now be turned around much quicker online. Weather, map links, and hospitals can be filled in automatically. Recipients receive personalized text messages to avoid information overload and confusion. They can be viewed nicely on smartphones for talent and crew on-the-go. Using call sheet software provides full visibility to when (or if) call sheets are viewed. We hope this was a helpful post on the anatomy of a call sheet. But what do you do once a call sheet has been created? Learn more about How Teams Approve Call Sheets on Short Form Projects. And, as always, let us know what you think in the comments below!